States in the Northeast are bracing themselves for yet another winter that may test the energy grid. From New York to Maine, the lacking natural gas infrastructure will have a huge impact on consumers’ natural gas and power prices this winter, write Chris Amstutz, Risk Management Associate, and Matthew Mattingly, Director of Natural Gas Services, at Choice Energy Services (USA). This is not news to residents of these states, who may now be numb to the financial impact of the persistent pipeline shortage. The United States produces the most natural gas and oil in the world, and it seems inconceivable that there would be an energy shortage in any region of the country. Is the story of the Northeast one of apathy or one of poor circumstance? Are New England residents suffering at the hands of environmental policy, or are they complacent with their current situation? Many argue these questions, but the fact is that New England may have dangerously low supply levels this winter, and price spikes for natural gas and power are a likely possibility. It is no secret that politics have played a heavy hand in setting up this situation. New York Governor Andrew Cuomo has been active in denying new energy infrastructure in his state. This year alone we have seen the denial of the William’s Constitution pipeline and the William’s Transco expansion. These projects would have collectively brought about 1 billion ft3/d in new supply New York, while freeing up additional supply to New England. In each of these cases the pipelines were denied for their WQC (Water Quality Certification), needed by the New York EPA. This denial process has been held up in the US Supreme Court against the companies that have challenged it. This year we also saw the revival of the already once denied Eversource Access Northern pipeline expansion project. This is not to be confused with the National Fuel Northern Access pipeline, which disputed its New York WQC ruling this past spring on grounds that the decision was made outside of the one-year time period for review, which resulted in an overturned ruling in favour of the pipeline. The Eversource project would expand the Algonquin pipeline system through Connecticut and would bring an additional 1 billion ft3/d in supply to the region. It is uncertain as to whether this project will be approved, but a supply shortage this winter would certainly help its chances. Planned investment through New York to New England is likely to slow further, as the Great Wall of Cuomo will likely be continued after the recent election. So how dire is the situation this winter? For power generation, ISO New England is openly acknowledging that they are one supply disruption away from issuing rolling black out orders in the region, if an extended cold event were to occur. Last year during the New Year’s Day arctic plunge, ISO operators were forced to bring on ageing, and potentially unreliable, coal fired plants to meet base load electricity demand. It is estimated that during the peak of winter cold, New England uses 4.5 billion ft3/d of natural gas. There are currently enough pipelines to supply 4.7 billion ft3/d of gas. 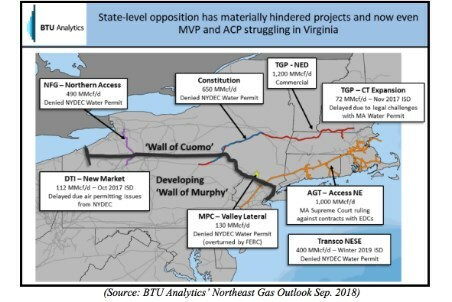 Without additional pipelines, every state to the northeast of New York will continue to rely on the Algonquin and Tennessee pipelines for domestic supply. Therefore, the remainder of supply comes from Canada, and from the LNG facility in Everett, Massachusetts. It is also important to note that any LNG imports will have to be from other countries at a heavy premium (Russia mostly) due to the Jones Act of 1920. The most natural gas to ever be imported via LNG in one winter was 31.6 billion ft3 during the polar vortex of winter 2014 - 2015. Last winter only 11.5 billion ft3 was imported via LNG. Behavior modifying programs aimed at reducing demand, such as Consolidated Edison’s piloting of a natural gas demand response program, will look to curb usage during peak periods. ISO-NE has also come out with a new 21 day fuel demand forecast and an Energy Market Opportunity Cost initiative. Both market-based tools are aimed at improving reliability for generators during peak demand periods. Innovative policies and programs will continue to be an important strategy in the future for utilities lacking pipeline supply infrastructure. Historically, how elevated can prices get? Last January we saw daily Transco Z6 NNY gas prices top US$125 MMBtu, and daily Algonquin prices top US$79 MMBtu. With storage levels in the region 10 - 20% lower than last year at this time, the situation could be much worse assuming a similar type of cold event. Real-time power pricing in Massachusetts also spiked to over US$500/MWh. The straight average of Mass Hub Real Time power for the month of January 2018 was US$108/MWh. These prices serve as a reminder to end users of the importance of hedging against winter uncertainty and the volatility that follows. Both ISO-NE and natural gas suppliers are going into the winter with the mentality of “not if, but when” will natural gas deliverability constraints become an issue. The story out of New England is a complicated one indeed. On one hand, you have financially minded people pointing out how many millions of dollars extra people are spending on energy prices; and on the other hand you have residents who have witnessed pipeline explosions destroy homes and believe that new pipelines will adversely affect the environment. It is a tough predicament to be in and the implications reach far into the economy and psyche of those that live in the region. While these are issues to explore at a later time, at this point the energy policies enacted in the Northeast have set up a dire pipeline shortage situation. New England has isolated itself from the largest natural gas supply region in the world, and as a financial consequence will now be at the mercy of the weather.